ZERO HEDGE / BATTLE FOR WORLD – September 27, 2018: The article highlights: It is that time of the year again. Every year, people start talking about a possible stock market crash in October, because everyone remembers the historic crashes that took place in October 1987 and October 2008. Could we witness a similar stock market crash in October 2018? The standard deviation of daily Dow changes is much higher in October than other months even if we eliminate 1987 and 2008 from the sample. CBS NEWS / BATTLE FOR WORLD – September 27, 2018: The article highlights that Corporate insiders are dumping stock in their companies at a rate not seen in 10 years. With September not yet over, stock sales by company executives reached $5.7 billion, according to data from TrimTabs Investment Research — the highest September in a decade. August’s $10.3 billion in insider sales also reached a 10-year record. SPUTNIK NEWS / BATTLE FOR WORLD – October 11, 2018: The article highlights the US stock market sustained yet another day of massive losses on Thursday (October 11) following Wednesday’s (October 10) sell-off of tech stocks. That the Dow Jones Industrial Average suffered a loss of 548 points Thursday after watching 830 points evaporate on Wednesday, sending the two-day decline well over 1,000 points. And as a result the Dow has now lost 5.3 percent of its value over the past two days, the most significant dip in the indicator since February 2018, the Associated Press noted. President Trump pointed the reason for the drops on the Federal Reserve’s decision to lift interest rates. “The Fed is making a mistake. It’s so tight. I think the Fed has gone crazy… It’s a correction that we’ve actually been waiting for for a long time, but I really disagree with what the Fed is doing,” he said Wednesday. RT AMERICA / BATTLE FOR WORLD – October 11, 2018: The article highlights: Anya Parampil reports on the US stock market downturn which began on Wednesday (October 10), finding that the mini-crash has rippled throughout international markets. Anya talks to Peter Schiff, CEO of Euro Pacific Capital, and Bart Chilton, Host of RT’s Boom Bust, to discuss what’s behind the meltdown and whether or not it could evolve into something to more severe. 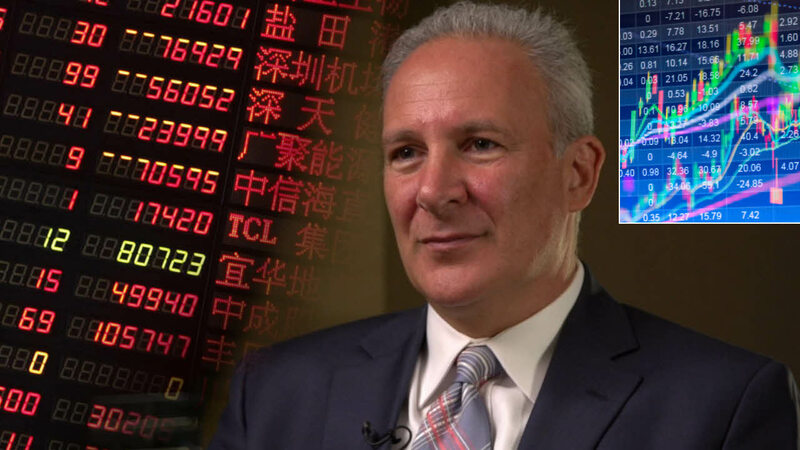 Stock bubble bigger than 2008 & coming crash far larger, warns Peter Schiff . Very terrible economic times ahead!!! RT / BATTLE FOR WORLD – October 14, 2018: The article highlights that Wall Street and the US economy are on the verge of recession, according to Peter Schiff, the CEO of Euro Pacific Capital, who raised alarms after this week’s market selloff. He told Fox News that “This is a bubble not just in the stock market, but the entire economy.” And Schiff predicts a recession, to be accompanied by rising consumer prices, that will be “far more painful” than the 2007-2009 Great Recession. “I think as Americans lose their jobs, they are going to see the cost of living going up rather dramatically, and so this is going to make it particularly painful,” said Schiff.